11-12-2014 • Categories: Clients, Jobfeed, Search! Amsterdam wants to attract and retain more international talent. The Amsterdam Economic Board – which brings together businesses, education institutions and government bodies in the Amsterdam Metropolitan Area – is committed to achieving this objective through its programme Amsterdam Works, under the brand I amsterdam. I amsterdam is the brand name used to showcase the city of Amsterdam globally to visitors, companies and (future) residents. The Amsterdam Economic Board has started proactively using the I amsterdam brand to promote Amsterdam as a great place to work or study. Efforts are also being made to create the right climate to encourage international talent to settle. The website www.iamsterdam.com contains extensive information on working, studying and living in Amsterdam. 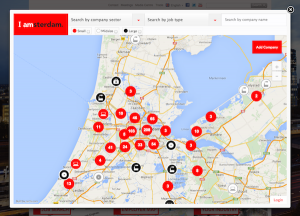 The portal iamsterdam.com/work provides a detailed picture of international employment opportunities in the region. With the Job search and Employer map visitors can access all job vacancies in English, and see a map showing where companies open to international talent are located. The portal also provides information on the biggest sectors in the region and on practical topics, such as housing and legislation. The Job Search uses both semantic search technology by Textkernel and its Big Data tool for jobs, Jobfeed, which collects, enriches and categorises all jobs in the Netherlands. Jobfeed then filters the results to show the target group the most relevant jobs: English-speaking professional-level jobs within in a 50km radius of Amsterdam, with Dutch not required. 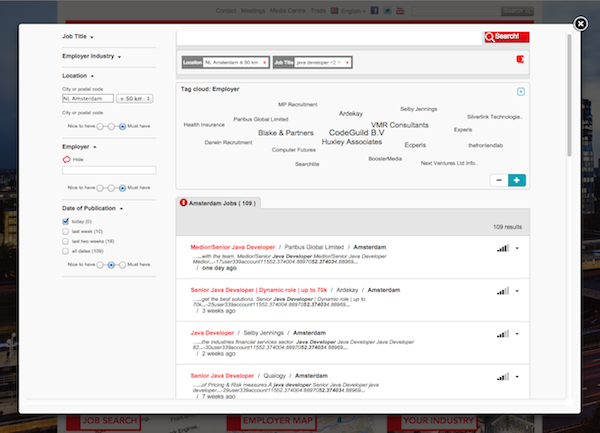 Thanks to Textkernel’s semantic search technology the jobs are easy to find using the Job Search tool. 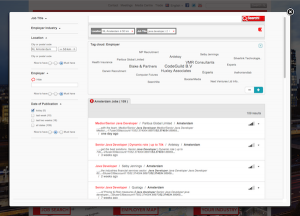 Moreover, this connects to an employer map, so that the current English vacancies are also visible by registered employer. “With the job search tool by Textkernel, international job seekers can quickly and easily find the jobs relevant to them”, Karoline Moors confirms. “International talent gets an insight into the English job offers that do not require you to speak Dutch, and you can easily filter by profession, industry and company size”. Employers in Amsterdam can register to appear on the Employer Map for free. The English jobs that meet the relevant criteria are automatically included in the job search. Next year, Amsterdam Works will also focus on proactively engaging international talent through social media and targeted acquisition abroad. The first priority will be to attract talent in the field of IT. For more information on the Amsterdam Works initiatives, contact Karoline Moors at, k.moors@amecboard.com. For more information on Jobfeed and Textkernel’s semantic search technology, contact the Textkernel team at demo@textkernel.com.